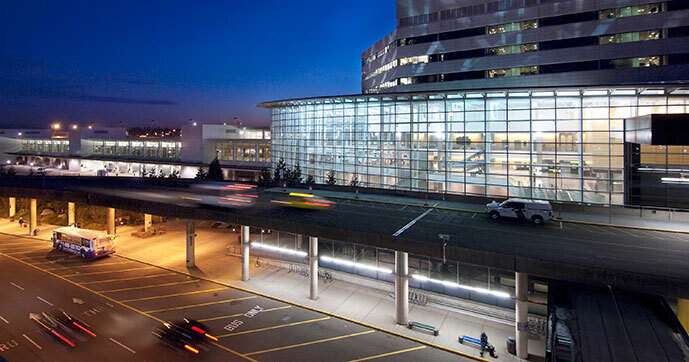 Seattle-Tacoma International Airport is a great alternative for people living in the Vancouver and Victoria area. It is about a 3 hours drive from Vancouver. Seattle is the hub for Alaska Airlines, Horizon Air and all of the major North America carriers (Delta, America, United, US Airways, Southwest, Jetblue etc.) offer service to Seattle. Seattle Airport also has service on many international routes, including service to Tokyo, Beijing, Frankfurt, London and even Dubai. Seattle is likely going to be your choice in an effort to save time and money. Fares to the US are often cheaper than Vancouver, but there are often more direct flights to more destinations out of Seattle than out of Vancouver. When selecting Seattle purely on cost, I have a personal savings threshold of $75 / person / way in required savings. From Vancouver and Vancouver Island, there are many options to get to the airport, including driving your own personal car, renting a car, shuttles, trains and buses. The fares range from $20 – $60 for public services and take 3-5 hours from Vancouver. If you drive your own car, parking can be had for as low as $8 / day. You can book in advance at About Airport Parking to guarantee your rate.